Christmas is coming. Obviously we are all hoping for a big dump of snow around the 23rd to get us into the festive spirit, and then a week of glorious winter sun between Christmas Eve and New Year’s Day, so that we can get out on our bikes and feel like we have earned some of that mulled wine and chestnuts on our return. But, on the off chance that the weather is miserable for the whole week, it’s important to get some good books laid down in preparation. I did wade through a bumper crop last year and this year is likely to be no different; though there is not much room left on the heaving bookshelves of the Jersey Pocket HQ (AKA our compact Blackheath home). With that in mind this year’s first request will be a set of works that hopefully gives maximum bang for shelf-space buck. “The Cycling Anthology” (Peloton Publishing) is, according to the blurb, ‘a collection of original writings by some of the world’s best cycling journalists’. A6 in size and roughly an inch thick, the series is now into a third volume. Priced £7.99 / £8.99 each – they offer a wealth of writing for less than the combined price of some hardback biogs. Volume One from 2012 includes (amongst many others) William Fotheringham on Wiggins, David Millar on retired teammates and, the one I’m looking forward to most, Samuel Abt on ‘Super’ Mario Cippolini. Volume Two from 2013 – an insider’s Tour de France special edition- includes Richard Williams, Ned Boulting and Daniel Lloyd, whilst Volume Three promises Klaus Bellon Gaitan on the post-Armstrong landscape, Richard Moore on the Tour de France Feminin and Kenny Pryde tackling the inevitable doping chapter, which is quaintly titled ‘Two-Bob Rockets’. 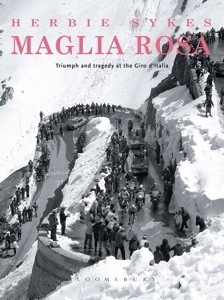 At the other end of the size scale is an ode to the Giro d’Italia: “Maglia Rosa. Triumph and Tragedy at the Giro” by Herbie Sykes (Bloomsbury Publishing £23). It was first published a couple of years ago so this is a new updated edition. No doubt stuffed full of gorgeous photography, this is meant as a bit of an antidote to all the Tour de France orientated books I always find myself unwrapping on Christmas morning. I’m a relative newcomer to the charms and history of the Giro and this looks like just the book to make good on my knowledge shortfalls. Sykes is English but he lives in Turin and has published a book on Coppi previously. With this year’s start in Dublin and vague talk of reducing the length of the Vuelta, now is the time to really get under the skin of the Italian Grand Tour. 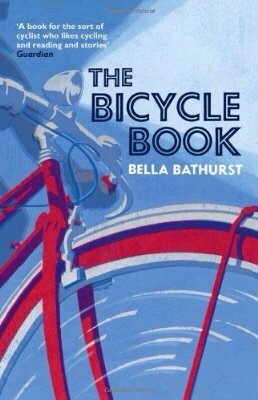 Lastly (for this piece anyway – I can assume you that the full list is a lot longer and shamefully includes some venerated titles I should have read years, possibly even decades, ago) is the simply-titled “The Bicycle Book” by Bella Bathurst (Harper Collins £8.99). Apart from it’s alliterative appeal, this one is on the list because of the author’s previous work. I read “Wreckers”, her account of Cornish piracy, some years ago and enjoyed the writing immensely. Described as a cycling book ‘for the rest of us’, finding out what her thoughts on cycling and cyclists are will be intriguing… I haven’t looked much more closely at the content than that as it’s good to retain some element of surprise for the big day. This entry was posted in Giro dItalia, Le Tour de France, Product Reviews and tagged books, christmas, Cycling, giro d'Italia, Tour de France. Bookmark the permalink.